I've been a "Wet shaver" for over 60 years, have used all types of shaving soaps from canned to creams, to pucks and solids like Napa's. 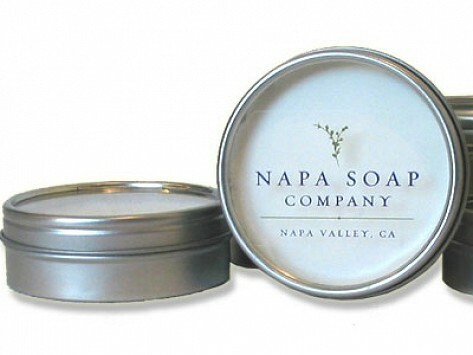 The Napa Ocean Blend soap is one of the best to date!!! It has a pleasant, not overpowering, smell, produces a nice slick lather and leaves my face feeling refreshed. I believe in patronizing artisans' products over the big name brands. They provide better products with fewer unpronounceable ingredients and, as small businesses, need our support. One of the best shaving products I have ever Used! Gives a smooth and close shave every time. My husband loves this product! I gave it to him as part of a gift and he has raved about it ever since. He's looking forward to trying every scent! This is my husbands favorite sent out of all of them. He travels a lot for work and finds this a perfect size. I bought this for my dad for Father's Day and he loves it! He likes the smell, brush and feel of the aftershave. He even made all of us feel his head afterwards to feel how smooth it us. I'll start by saying my husband doesn't like to shave very often so he considers it a burden! I ordered the travel set for home and travel and my husband loves it! He love the brush and his shave is the closest he has had! Will only purchase this from now on! I surprised my husband and bought him this Napa Soap Company Travel Size with Brush. He has never used anything else again. He said the brush is the best he has ever used. Do not hesitate to order this product you will not be sorry. Ever try to decipher what goes into most shaving foams and gels? You need a friend with a PhD in chemistry to explain the ingredients. But not with products from Napa Soap Company. The contents of their handmade shaving soaps sound good enough to eat. Sheila Rockwood grew up in the Napa Valley and set out to create skincare products that use local resources from this bountiful region. Her shaving soaps for men (lots of women also use them) are made with natural ingredients such as grapeseed oil, wine, honey, aloe vera and french clay to keep skin smooth and nourished. They’re economical, too. One shaving mug contains up to a year’s supply of shaving soap, plus it comes with a classic barber shop-style brush. Imagine how many cans of regular shaving cream you won’t have to buy—and send to the landfill when they’re empty. 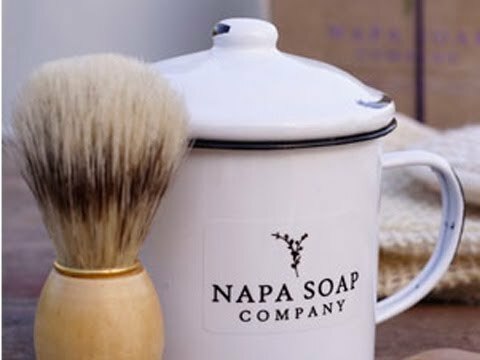 When Napa Soap’s shaving supply is gone, you can reuse the container (you can choose either a traditional ceramic mug or an old-school enameled mug).